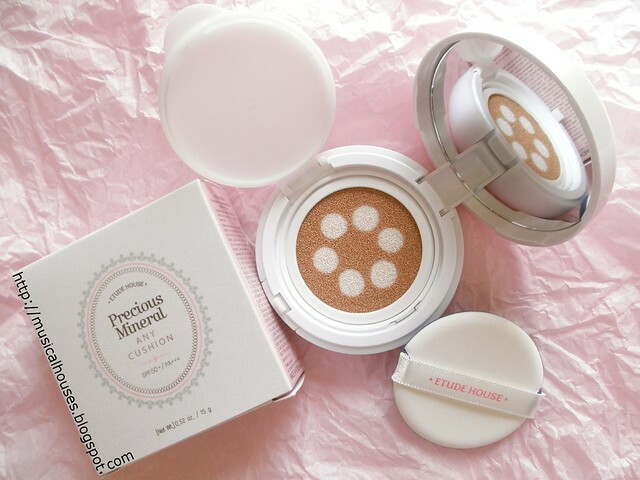 Etude House's Any Cushion Pearl Aura (full name Precious Mineral Any Cushion Pearl Aura) is the latest BB cushion to come from the brand. The Pearl Aura Cushion is, as the name suggests, infused with a brightening liquid for "pearl aura", or a highlighting effect. 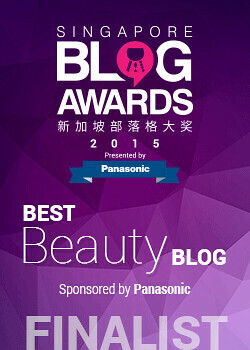 The idea is that the "pearl aura" will give you the glowy skin finish that is so popular in Asia, particularly Korea. As an additional benefit, the Pearl Aura Any Cushion also comes with SPF50+/PA+++ for sun protection, too! I kind of have to admit, despite the popularity of glowy skin, I've found it to be something I have mixed feelings towards. 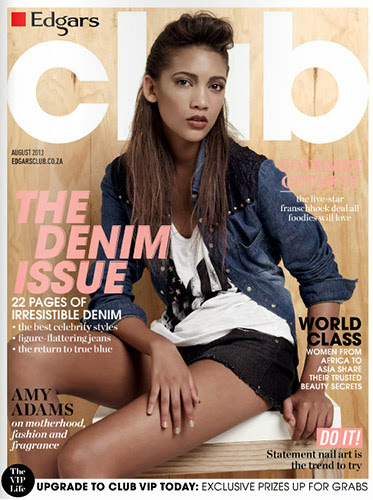 While I love the idea of glowy skin - I mean, nothing says youth like radiant-looking skin, right? - when you live in a hot and humid climate, as I do, sometimes the "glowy" finish really verges more into "sweaty, and really gross looking" instead. It's rare to find a product that has enough glow to be noticeable, but still subtle enough to not look too glittery or overdone. So, I decided to put the Any Cushion Pearl Aura to the test, and see how it fares on me! 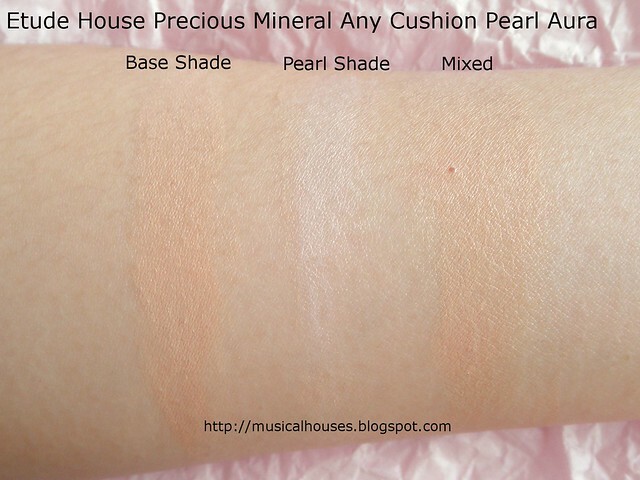 Etude House's Pearl Aura Any Cushion comes in only two shades, "Light Pearl Aura" and "Natural Pearl Aura". I have the shade Natural Pearl Aura for review today. There's so many questions we have to answer: What's the finish of this really like, glowy or gross? How does it fare on your skin? And what exactly is the "Pearl Aura" made of, anyway? So, let's get to the review! Etude House Any Cushion Pearl Aura: The little white dots are where the shimmery highlighting liquid are! 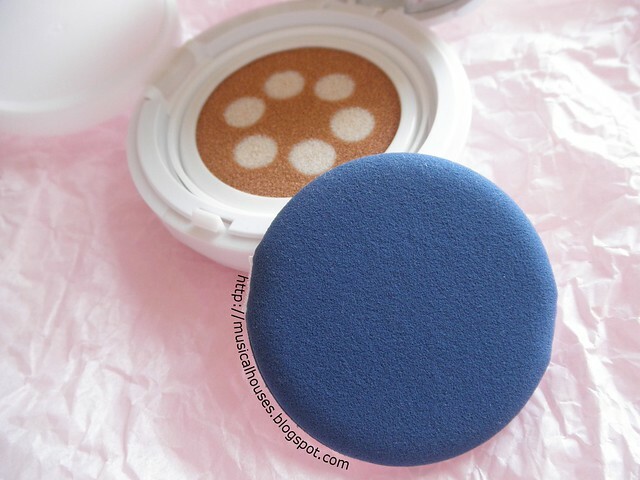 The Etude House Any Cushion Pearl Aura has the cutest sponge - it has 6 little "pearl" white dots in the sponge! And the coloured dots are not just coloured by the sponge, either - when you press on the dots, you actually do get a white shimmery liquid, whereas the rest of the sponge has a non-shimmery base colour. So when you press your applicator puff down on the cushion, you get a mix of both the shimmery white liquid and the non-shimmery colour, and when applied, the two will mix together to give the glowy "pearl aura". It does look cool, but as you use the BB cushion more and keep blending the two shades, the white dots will start blurring up, and the outline won't be as sharp as it originally is. It doesn't change the colour of the Any Cushion on your face though, so it's more of an aesthetic thing than a functional thing. The Pearl Aura BB Cushion comes with the usual BB cushion puff - the standard polyurethane puff, which I've written about briefly in my BB cushions vs BB creams post. 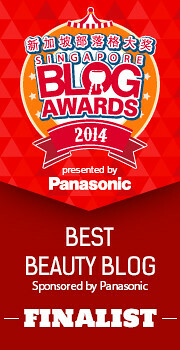 It's not anything particularly special, but is good for getting a thin but even application of the BB cushion. And, swatches! 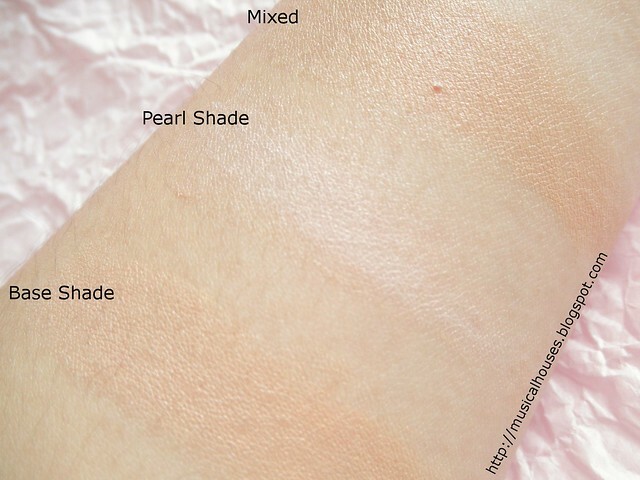 As you can see, the "base" shade is non-shimmery, while the "pearl aura" shade is a white shimmery shade with a slight pink iridescence, similar to that in the Etude House Beauty Shot Face Blur. Although the base shade by itself is actually slightly too dark and too pink for me (I'm rougly MAC NC20, for those who want a comparison), it can be sheered out with a lighter application. Also, when mixed in with the "pearl aura" shade, it becomes a slightly lighter shade (slightly being the operative word here). Above, I've tried to try to get the swatches at an angle to catch the light so you can see the slight pink iridescence, but it wasn't very successful - while I could see it in person, it just eluded me in photos. The pink iridescence is quite slight, and doesn't actually show up as a pink tinge on the skin, but is more of a slight "glow" instead. But you can see the overall glow in the product in this photo! And, here's my favourite part of the review - the ingredients analysis! The main ingredients in the Pearl Aura Any Cushion are water, silicones, polymers and film-formers (Cyclopentasiloxane, Cyclohexasiloxane, Phenyl Trimethicone, Acrylates/Ethylhexyl Acrylate/Dimethicone Methacrylate Copolymer, Vinyl Dimethicone/Methicone Silsesquioxane Crosspolymer, Methyl Methacrylate Crosspolymer, Triethoxycaprylylsilane), UV filters (Zinc Oxide, Titanium Dioxide, Ethylhexyl Methoxycinnamate), humectants (Butylene Glycol, Caprylyl Glycol, Glycerin), Niacinamide (which has skincare benefits in cosmetics, and is primarily used in anti-aging products), and functional ingredients like stabilizers and thickeners (Sorbitan Isostearate, Disteardimonium Hectorite). The "pearl aura" appears to come from the Mica in the product, as this is the main difference between the ingredients in the base shade and the highlighting shade. The Pearl Aura Cushion also contains Mother of Pearl in small amounts, which may also add to the additional pearly finish of the product. 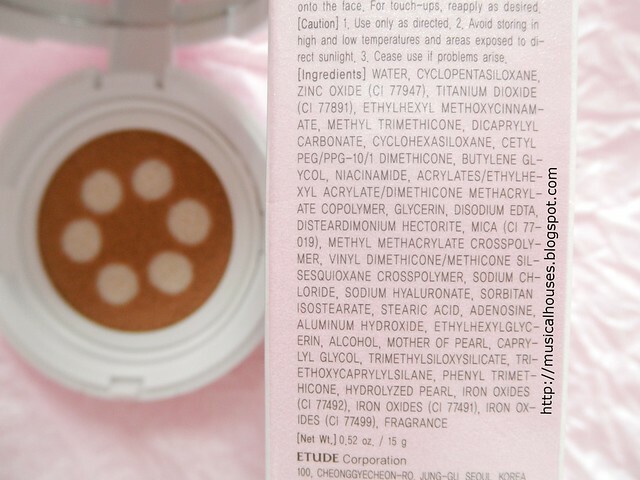 So, from the ingredients list, it seems like the Pearl Aura Cushion is formulated to be a lightweight product with some UV protection benefits, with some secondary skincare benefits from the inclusion of Niacinamide and some humectants. While I'm known for being somewhat critical with respect to the ingredients in BB cushions and BB creams with posts like this and this, I have to say, the ingredients list in the Pearl Aura Cushion are actually pretty impressive - there isn't anything that strikes me as being super pore-clogging or irritating (unless you are sensitive to silicone-heavy products), and the inclusion of some skincare ingredients (both from the UV filters as well as the Niacinamide and humectants) is also a bonus too. 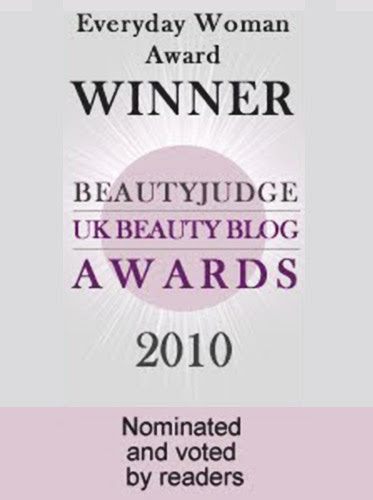 And, of course such a product review demands an FOTD (Face of the Day)! I'm not sure if you can see it in the photo, but the BB cushion is slightly too pink for my skintone, although it is roughly the same shade depth. The Cushion also has a light, fairly glowy finish that is also more apparent in real life than in the photo, but not in anyway too glittery or OTT. 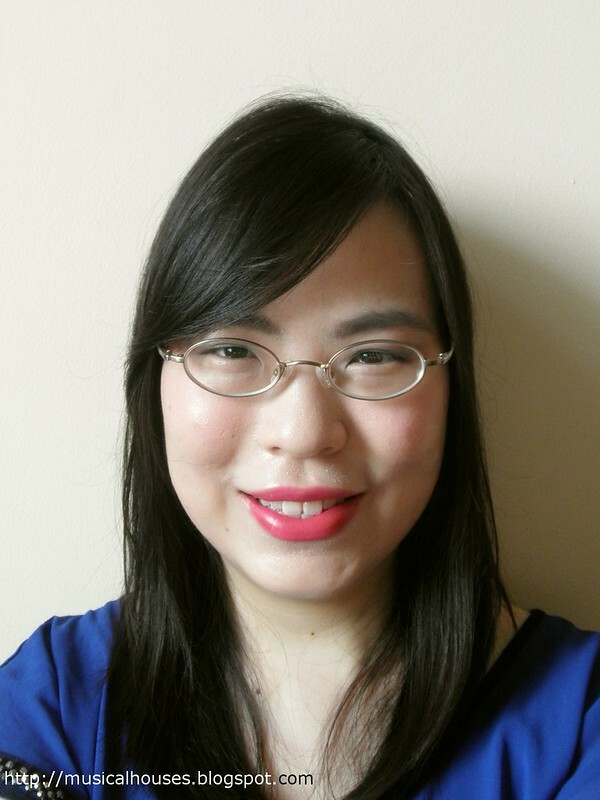 When I wore it, I had a couple of comments that my skin looked better, which I take as a good sign that the finish successfully achieved being "glowy" rather than "oily". It also didn't feel heavy or oily on my skin, which is a plus. I wore it for maybe half a day in fairly sedentary conditions, and it generally had good staying power, and didn't oxidize or slide off. 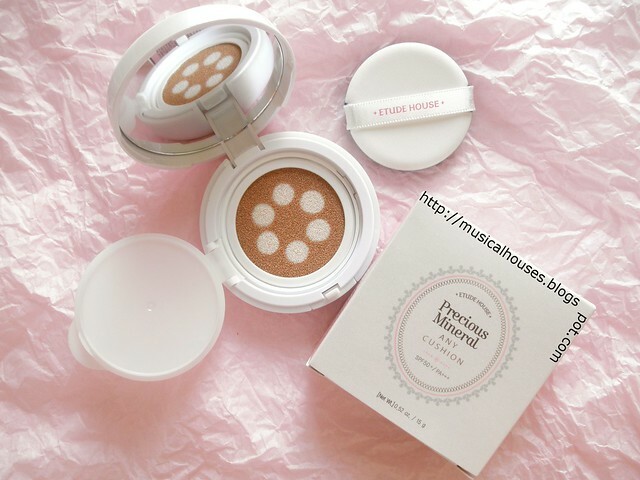 Lastly, although Etude House bills this as "full coverage", like most BB cushions I've found this to be light-medium coverage at best, and had to use a separate product to conceal some blemishes and pimple spots. So, would I recommend this? I really liked this product - it was lightweight product with light to (maybe) medium coverage, and does give you the nice glowy finish as advertised, and lasts for a decently long period of time without oxidizing or melting off. I also particularly liked that the formulation is well done, with some skincare and sunscreen ingredients, and with fairly non-irritating ingredients as a whole. At SGD$32, it is also pretty budget-friendly as well. So if you're looking for a good all-around base product with a glowy finish that doesn't break the bank, this is worth looking at. 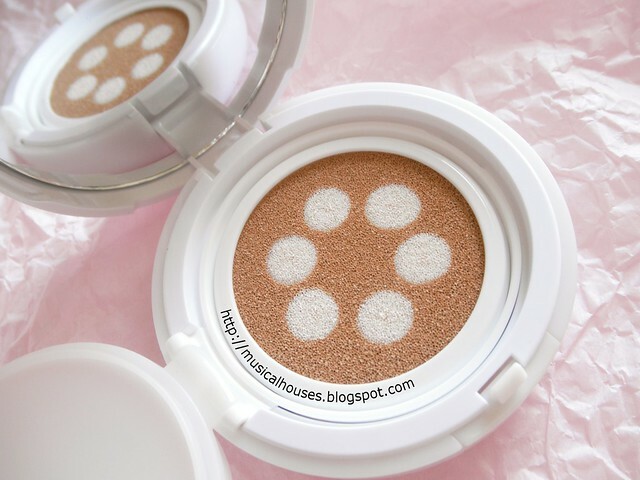 The Bottom Line: The Etude House Any Cushion Pearl Aura is a lightweight, sheer coverage base product with a good formulation that does give the glowy finish promised. Is light pearl shade... really too white?